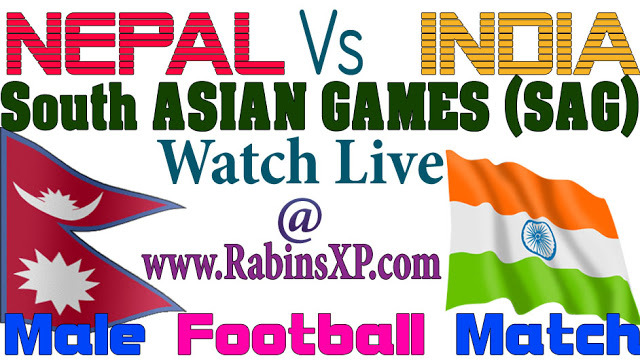 Thanks for watching live Nepal Vs Nepal Vs India male football of South Asian Games (SAG) online on this page. The second last day match between India and Nepal happened at Guwahati and Shillong where a majority of Nepalese people live there. The live televised version (DD Sports) was aired then which showed the “Nepal V India SAG Football” games of the males at 19:15 NST or (07:15 PM). You can still watch the recorded video here. Please bookmark this page for your easiness. Press Ctrl+D to bookmark or you can also use the short link provided at last of this page. A counter or time remaining to for this match India V Nepal to start is been removed now. Please follow the time or counter that would remind you when the match would start. Thanks for watching Nepal (नेपाल) V India SAG Male Football Match. Did you know about SAG? – The South Asian Games, a multi-sport event, is the Regional Games of the Olympic Council of Asia. Since it was first hosted by Kathmandu, Nepal in the year 1984, except for few occasions the event is taking place every alternate year. This mega multi-national sports event is held among the athletes of the South Asian countries in various locations across the region. The event is presently joined by the eight South Asian countries namely Afghanistan, Bangladesh, Bhutan, India, Maldives, Nepal, Pakistan and Sri Lanka. The event is unique in itself as it promotes sports with a view to boosting up the team spirit as well as an amiable relationship between the South Asian countries. Nepal won 2016 South Asian Games by defeating India by 2:1 goals.